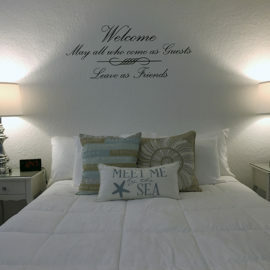 The Sea Spray Inn offers 16 very nicely decorated apartments with plenty of room to truly enjoy your beach getaway. 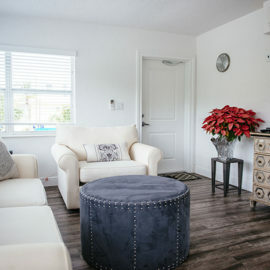 Each apartment exudes comfort and style and offers a fully equipped kitchen, dining area, modern bathroom with a walk-in shower and a spacious walk-in closet with safe. 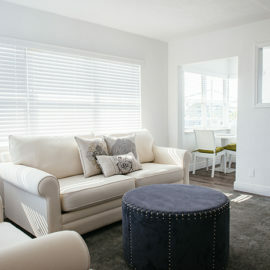 Amenities include free off-street parking, free wireless High Speed Internet, new pillow top mattresses, beach towels, hairdryer, iron – ironing board, makeup wipes, air conditioning, and alarm clocks. 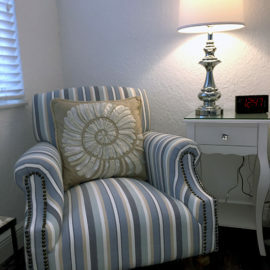 Apartments are serviced on a weekly basis as most of our guests enjoy their privacy. However daily towel service is provided. 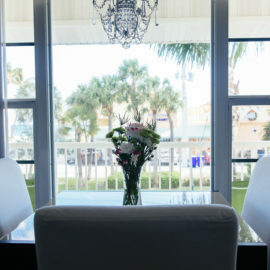 Copyright © Sea Spray Inn LBTS LLC. All rights reserved. All units are equipped with Air-Conditioning. The temperature controls can be set with the remote control which are located on the wall or on a table. Please make sure that all windows are tightly closed to allow unit to achieve the desired temperature. Closing the windows allows it to work more efficiently and thus conserves energy. Please DO NOT turn the Air-Conditioning OFF. If you are cold, or if you wish to open a window, DO NOT the Air-Conditioning OFF in your room. If you turn it OFF the humidity will increase inside the room and this will result in the proliferation of mildew and mold inside the AC unit and inside the room. Instead, please set the AC temperature to 76 degrees and then you can open a window. At 76 degrees, the Air-Conditioning unit will help remove the humidity inside the room and will prevent the proliferation of mildew and mold. For your convenience we have a computer and a printer at your disposal, free of charge, in the Guest Lounge. Feel free to use this computer to print boarding passes, or to get your emails. NOTE: For security reasons, remember to close your personal email session before you leave. Complementary Washer/Dryer are offered for your small personal laundry and for your convenience. The laundry area is provided to our registered guests only. The laundry area shall be kept clean at all times by anyone using it. Instructions and guidelines posted in the laundry area shall be followed and respected by anyone using the laundry machines. Use of BLEACH is prohibited. Detergent can be purchased at the office for a small fee. 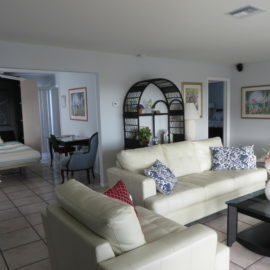 High speed Wi-Fi Internet is available for free throughout the property. This service is available only to registered guests. Feel free to access the Internet for emails, and to surf the Internet. We ask, however, that you restrain from streaming videos and from downloading large files such as movies. This would restrain the bandwidth and prevent other guests from enjoying an efficient Wi-Fi connection. One Off-Street parking space will be assigned to you at check-in upon request. Out of respect to other guests, please use only the parking space assigned to you. A parking pass will be given to you at check-in. This pass must be displayed on your dashboard at all times while parked at the hotel to avoid being towed. One ADA parking space is also available upon request. Pool operation is from DAWN to DUSK only. Otherwise the pool is closed. Children under the age of 18 must be accompanied by a parent /guardian at all times. Children who cannot swim, or under the age of 13, must be accompanied in the water by a parent /guardian at all times. There must be a ratio of one parent / guardian per child. No diapers are allowed in the pool, regular or swim diapers. Inner tubes and rings are allowed for use but please respect other swimmers. Glass containers are not allowed near the pool. Acrylic glasses have been provided to you for this. Food is not allowed in the pool. No running around the pool. No diving, pushing, shoving, horseplay, or inappropriate behaviour is allowed. Diving, backward dives and flips are prohibited. Individuals who cannot swim should remain in the shallow end.